San Francisco, LA, Vegas and the Grand Canyon. Take the trip of a lifetime through America’s glorious western states. You’ll visit three of America’s most iconic cities, and soak up the Californian sunshine as you head down the Pacific coastline and then inland – across the Mojave Desert – to the Grand Canyon, before finishing your adventure in sunny San Diego. Flights also available from other UK airports – Belfast City George Best, London Heathrow, Manchester & Newcastle – click here for more information on available dates and prices. Fly west, across the North Atlantic, to San Francisco, the fabled ‘City by the Bay’, and transfer by coach to your first hotel. Today’s optional guided tour offers an excellent way to get to know this diverse city. After a short introduction, we’ll cross the breathtaking Golden Gate Bridge to the delightful waterfront community of Sausalito. Here you’ll have time to explore this lively town, where the Beat poets and artists once thrived, before returning to the city by ferry, passing forbidding Alcatraz Island. Then perhaps explore bustling Fisherman’s Wharf and its many shops. Spend the day at leisure. 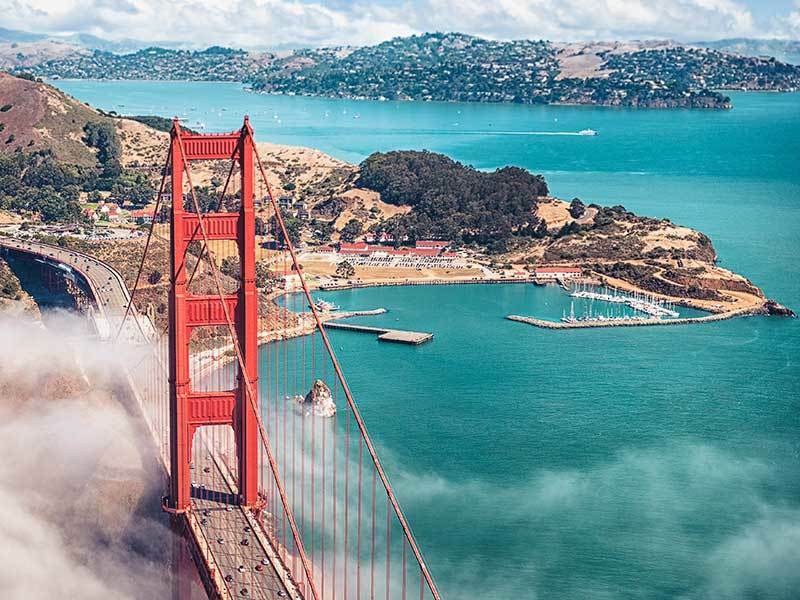 Perhaps take a walk along the Bay to Pier 39 for a glimpse of the sea lions, stroll through the beautiful Japanese Tea Garden in Golden Gate Park, or visit the shops for a souvenir of your trip. This evening, why not head to colourful Chinatown or choose from one of the excellent eateries on Nob Hill? Today we head south, following the Pacific coastline of Monterey Bay. We’ll call at two towns linked by the scenic 17-Mile Drive – Carmel-by-the-Sea, renowned for its natural beauty and rich artistic history, and Monterey, immortalised by one-time resident John Steinbeck, before continuing to Pismo Beach for an overnight stay. Continue our journey south towards the sprawling metropolis which is Los Angeles. En route, visit the star-spangled streets of Hollywood before continuing to our hotel for a three-night stay. Relax and explore LA, or join an optional excursion to discover the gorgeous, yet very different coastal resorts of Santa Monica and Malibu. Stroll down the Santa Monica boardwalk, see the pier and Ferris wheel and enjoy the exceptional shopping on Third Street Promenade, then take the beautiful coastal drive along the bay to chic, picturesque Malibu. Join today’s optional excursion to Palm Springs, where many of Hollywood’s stars made their country homes. Visit the marvellous ‘Living Desert’ conservation zoo, journey to the heights above on the world’s longest revolving cable car, and enjoy the chance for some shopping in the desert-city’s iconic shops and boutiques. Today we head inland and across the desert to Laughlin, an oasis bordered by rugged desert and the Colorado River, and your base for the next two nights. Our included visit to the Grand Canyon introduces you to one of the world’s greatest natural wonders and to nearly two billion years of the Earth’s geological history. Experience the canyon’s awe-inspiring beauty from above on our optional flight by helicopter – truly an unforgettable experience. Today you’ll journey to Las Vegas for a three-night stay in the World’s Capital of Entertainment. Discover stunning, glittering, glorious Las Vegas, the world’s most colourful entertainment centre. Nothing can prepare you for the glitz, glamour and sheer scale of this monument to man’s capacity for fun. Perhaps visit the Hoover Dam on our optional excursion. One of the most remarkable engineering feats of the 20th Century, the dam contains Lake Mead, and is one of the most popular tourist attractions in the US. This evening, join our optional helicopter flight for the chance to see its colour and opulence from the skies above. Spend today exploring Vegas. There are countless attractions to enjoy, from dancing fountains and downtown ‘mega resorts’ to shopping malls and restaurants. Today we’ll head back to the shores of the Pacific, making for the laid-back coastal city of San Diego, one of California’s most sparkling jewels. Rest, relax and explore San Diego at your leisure. Highlights include the historic Santa Fe Railroad Depot and the Gaslamp District. Across the Bay Bridge, Coronado Island is home to the Hotel del Coronado, where ‘Edward’ first met ‘Mrs Simpson’, and where Marilyn Monroe filmed ‘Some Like it Hot’. Today we head back towards the coast, and to Los Angeles, to check in for your overnight flight home.